Put your animal companion in the care of a team that focuses on his or her overall health and happiness. 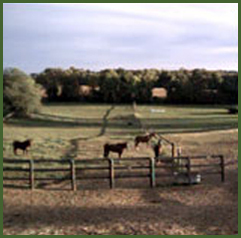 When you rely on Churchville Farm LLC, you get a variety of value-added horse care services, as well as meticulous upkeep. We offer full board services, pasture board services, and more. Explore a wide range of options to find one that best fits your individual needs. Please contact us for current rates on our services. Strengthen your horse's psyche, as well as your own with interactive horseback riding services from our team. We have two outdoor horse riding rings, one of which is illuminated for night riding. For more experienced riders, we have a jumping ring perfect for you. The course design includes a variety of challenges for both horse and rider. Anytime is a great time for a scenic trail ride around Churchville Reservoir. Enjoy the many marked trails winding their way through this beautiful natural habitat. Reach out to our team if you'd like to know more. Churchville Farm LLC offers horse transportation upon request. Let us know your specific needs and we'll take care of you.